Creamline Dairies (www.creamline.co.uk ) – the long established, Trafford – Park based family company – has announced that Salford volunteer Jean Roberts is the winner of this year’s Cream of the Community Award. Calling on the people of Greater Manchester and Cheshire to nominate community –spirited family members and friends, Creamline was bowled over by Jean’s commitment to her local area, selflessly giving her time volunteering at the Worsley ‘Contact the Elderly’ group, helping tackle loneliness and social isolation amongst older people, in the form of a monthly tea party. Nominated by her fellow volunteer Kaye Willan, who provided details of Jean’s inspiring actions, including her weekly volunteering stint at her local St Ann’s Hospice, which provides care for thousands of patients and their families and carers each year across Greater Manchester, who are affected by cancer and non-cancer limiting illness. 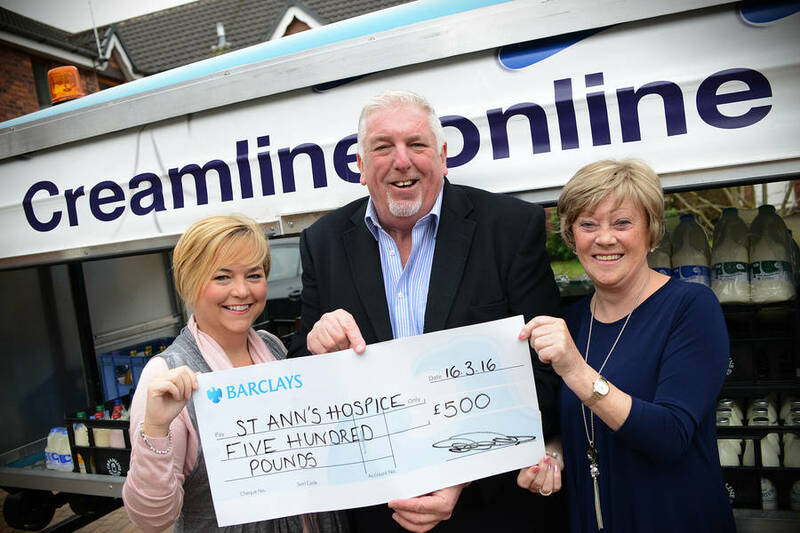 As the winner of the Creamline community title, Jean has received a £500 prize to be donated to the charitable cause of her choice, St Ann’s Hospice, an organisation that she has personally supported for 5 years. As well as being awarded the Creamline charity donation, Jean and Kaye are both set to receive a three-month supply of Creamline’s new offering – a local market fresh fruit and veg service, which is delivered straight to your door. Creamline prides itself on supporting the communities it serves. This month the company was recognised with a Business Masters award, winning the Pride/CSR accolade for their charity work, which along with the Cream of the Community award includes the long-established Creamline Lottery, which has awarded tens of thousands of pounds to local good causes – including Francis House and Cre8, the Macclesfield based Christian youth and community programme.